Pursuant to Section 7-246(b) of the General Statutes, The Brookfield Water Pollution Control Authority (Authority) hereby promulgates its Water Pollution Control Plan for the Town of Brookfield. This Plan repeals and supersedes the previously adopted Water Pollution Control Plan adopted on August 22, 2012. To designate and delineate the boundaries of the areas in which the Authority provides or is expected to provide municipal sewer service. To designate areas where sewers are to be avoided. To document the Commission’s policy for the effective utilization of existing sewer capacity, and to establish a policy for the proper planning of capacity management prior to the construction of any new or additional sewerage facilities. To manage sewer service in a manner that will foster commercial and industrial development, thereby promoting economic growth for the benefit of the Town of Brookfield as a whole. To support and complement the Brookfield Plan of Conservation and Development, adopted on November 11, 2001. The Southwest and Federal Road Sewer Areas comprise those properties serviced by existing sanitary sewers within the Federal Road corridor, and includes the area of Grays Bridge Road, Old New Milford Road, Greenknoll Drive, Junction Road (Route 133), Commerce Drive and Laurel Hill Road, Delmar Drive, Sandy Lane and Old Grays Bridge Road in which municipal sewers presently exist. The Southwest Area is generally defined as the area located southerly of the intersection of Federal Road and Junction Road (Route 133). The Federal Road Sewer Area is generally defined as the area located north of the intersection of Federal Road and Junction Road (Route 133) to the New Milford town line. The Southwest and Federal Road Sewer Areas consist of properties presently connected to the sewer system, properties for which a benefit assessment has been levied or is expected to be levied and properties for which a reservation of sewer capacity has been formally established. The Center School Sewer Extension Area comprises those properties presently served by and connected to the existing Center School Sewer Extension along Silvermine and Pocono Roads, including Center School. The White Turkey / Candlewood Lake Road Sewer Area comprises those properties presently served by and connected to the existing sanitary sewer extending from Federal Road to the Huckleberry Hill School. The West Whisconier Hill Road (Three Condominium) Sewer Area comprises those properties presently served and connected and those properties presently assessed within the following condominium projects: Stony Hill Village Condominiums, Whisconier Village Condominiums and Cedar Brook Condominiums. The sewer district also serves properties presently assessed within a limited area zoned for industrial use along Vale Road (including 101, 101 A and 111 Park Ridge Road, (all formerly 20 Vale Road), Sand Cut Road and Gray’s Bridge Road and the Whisconier School. No property other than the specified condominiums, the Whisconier School and the industrial properties for which a benefit assessment is levied may connect to this sewer extension. The Brookfield High School Sewer Area is a sewer extension running to the Brookfield High School from the Center School Sewer Extension. 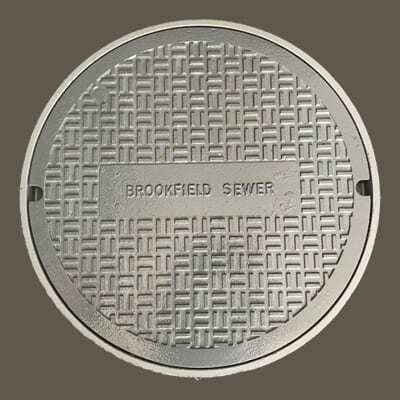 This is a single use municipal sewer area to serve the Brookfield High School only. No property other than the Brookfield High School may be connected to this sewer extension. (Blue) “Future Anticipated” Note: Two properties at the intersection of Federal Road and Junction Road that have been subject to a reservation of sewer capacity agreement are indicated as “Future Anticipated” on the Sewer Service Area Map. This is a proposed sewer area to be served by an extension from the Center School Sewer Extension to provide sewer service to the High Meadow, Ledgewood and Newbury Crossing condominium projects. The project has been fully designed and approved for construction with construction expected to be completed by 2015. The Town of Brookfield presently has an InterLocal agreement with the City of Danbury allowing 500,000 gallons per day of wastewater discharge from Brookfield to be treated at the Danbury Wastewater Treatment Plant. An analysis of treatment capacity is the subject of an extensive study published June 2012. As part of the long range sewer system plan, the Authority concludes that a policy of sewer avoidance is appropriate for all areas of Brookfield that are not served or to be served by existing or planned sewerage facilities. The only recognized exception to this sewer avoidance policy is when municipal sewers are the only reasonable means of remediating water pollution caused by multiple septic failures in a particular geographic area. With this limited exception, the Authority will not extend, nor permit the extension, of sewers to serve areas or properties outside of the existing or planned sewer service areas. Given this policy of sewer avoidance, new development and construction beyond the limits of these sewer service areas shall not exceed the ability of the land on which it is located to adequately support proper on-site subsurface wastewater disposal. The Authority expects that appropriate municipal agencies, including but not limited to the Planning Commission, Zoning Commission, and Building and Health Departments, will effect policies to assure the long term adequacy of on-site disposal, including the monitoring of disposal systems, the identification of malfunctioning systems and the requirement for effective on- site repairs. Deviation from this sewer avoidance policy shall be entertained only in cases where municipal sewer construction is the only reasonable means to mitigate an existing or threatened pollution problem. The entire costs of the connection, including the cost of any sewer extension, shall be paid by the lot owner. The Authority considers several areas of Town to be “potential remediation areas”. The Authority anticipates that municipal sewer service may eventually be extended to serve these areas. The Authority, presently, has no schedule for design or construction of sewers to serve these areas and expects that action will not be taken until such time as funding and need coincide. The Authority recognizes that long term needs may require localized treatment of wastewater by “community sewerage systems” or by extension of collector sewers to serve these areas. The Authority will be sensitive to sewer extension proposals submitted by the private sector when such proposals serve the public interest by providing for the extension of limited sized sewers to remediate problems in these remote areas. Community sewerage systems (as defined in Section 7-245 of the Connecticut General Statutes) shall not be used as a device to extend sewer service for new construction beyond the limits of the existing sewer districts. Unless necessary to abate or mitigate an existing or imminent pollution problem, no community sewerage system involving package treatment plants, subsurface septic systems or subsurface leaching systems shall be permitted in the Town of Brookfield. It is recognized that several historical existing, privately owned community sewerage systems having subsurface septic systems or subsurface leaching systems currently exist. These include High Meadow Condominiums, Ledgewood Condominiums and Newbury Crossing Condominiums, Lake Lillinoah Condominiums, Brookfield Hills Condominiums, Woodcreek Village Condominiums and Orchard Place Condominiums. None of these community sewerage systems were approved by the Brookfield Water Pollution Control Authority and none are subject to a management agreement with the WPCA to ensure effective operation, management, maintenance or replacement. High Meadow Condominiums, Ledgewood Condominiums and Newbury Crossing Condominiums are located in the High Meadow / Ledgewood/ Newbury Crossing Sewer Area. Although sewer service will be provided to these condominiums once the current construction project is completed to allow discontinuance of portions of their community sewerage systems, each condominium will continue to maintain a community sewerage system consisting of gravity sewers as necessary to convey condominium sewage to the municipal system. Other privately owned community sewerage systems that are presently connected to the municipal sewer system serve Cedarbrook Condominiums, Sandy Lane Village Condominiums, Stony Hill Village Condominiums, Whisconier Village Condominiums, Rollingwood Village Condominiums and Newbury Village Condominiums. The Authority has approved privately owned community sewerage systems at the proposed Riverview Affordable Housing Condominiums and at Oak Meadow Affordable Housing Condominiums. No areas of the Town have been designated or are under study as “areas to be designated as decentralized wastewater management districts”. The Authority recognizes the need for the preparation of a Facilities Plan, projecting the sewerage needs of the Town twenty (20) years into the future. Nothing contained in the Water Pollution Control Plan shall be deemed to amend or revoke any provision of the Authority’s Sewer Use Rules and Regulations.